Our hand-made hats ship in 6-8 weeks and our custom leather in 3-5 weeks. For those visitors visiting us for the first time, we strive for accuracy and authenticity in the cowboy hats, and classic cowboy leather we reproduce from the 19th and early decades of the 20th century. And if you have a favorite western or cowboy movie hat (who doesn’t!) chances are we make it or have something close that we can modify. You should find our website easy to get all the information you need when ordering, simply by clicking on the tabs 1/2 way down each product page. There you will find our hat colors, leather colors, options and instructions for hat sizing, measuring yourself for a gun belt, and other useful information about our products. In the 1880s more than 50 % of North America lived on farms and ranches. It was therefore a necessity to be a jack-of-all-trades, and to be successful all the small towns that supported the farms and ranches of each area needed three important businesses. A Blacksmith, a Saddle Maker and a General Merchandise Store were important to the survival and prosperity of each town. If the outfitter didn’t have the hat you wanted, chances were he had a catalog where you could order your prized western hat. And being skilled workers with leather, most town saddle makers were commissioned to make cowboy leather, and a cottage industry thrived in the 19th and early decades of the 20th century. Thanks to the Internet those days have returned. Why bother with cheap and inferior mass produced cowboy gear made overseas, when for a few extra bucks you can have quality custom cowboy hats and leather work made by cowboys. Customers Love our cowboy gear – read all about it here! Buffalo Bill Cody was the most well know personality of his day. One hundred years ago, in 1917, when Buffalo Bill died, he was the most recognized person on earth. Because of Bill Cody we have the modern day rodeo and the circus; and the world still loves cowboy hats and boots. To Celebrate Bill Cody’s life and legacy we have reproduced this great rendition of Buffalo Bill’s own hat. Our Union Cavalry Hat in Navy Blue, order Silver Mist or Sahara if you wish the confederate version. In 2016 we added 2 new colors, Buckskin a nice warm earth tone, (seen on our Frontera hat) and Navy Blue seen on our Union Cavalry Hat. If you are unfamiliar with the Tom Threepersons holster design and the story, it is one of the most confusing and convoluted in the history of the old west. Also one of the most fascinating. Because there were two Tom Three Persons who made their names in the North American west in the decades following the turn of the 20th century. One of them was legendary Sheriff and G-Man Tom Threepersons, who was born in the Oklahoma Indian Territory in 1889, in the middle of the Old West, and lived a rough and tumble life. Our hand made cowboys hats ship in 6-8 weeks and our beautiful leather in 3-5 weeks. We allow clients to switch hatbands between hat styles, and request different crown and brim dimensions. As well you get your name stenciled on the sweatband inside the hat. We make our Hand Made Holsters, belts and Indian Rifle Sheaths to fit your firearms. We offer custom fit on our holsters for almost any pistol, and make our gun and cartridge belts to your waist and cartridge size. Enter your info in the comments box during checkout. Our hand-made hats and custom leather are made to order and to last! It’s the last thing you take off, and the first thing that’s noticed! Our custom western hats are made the old west way – one at a time, starting with the best fur-felt hat body available – made in the USA – and fashion as fine a custom western hat as you can find anywhere. The Last Best Cowboy Hat. One of a kind Fur-Felt Art. Purchase one of our fine beaver/blend hats and you will receive the same quality and workmanship that is worn by more than a dozen of the world’s premier rodeo cowboy’s riding today. Production Companies, Politicians, National Security Advisors, Musicians, Writers, Cartoonists, Artists, Athletes, Soldiers, and lots of every day folk love our hats, and we hope you will as well. Hand-made holsters, belts, sheaths, chaps and leather accessories. Back in the 1880s cowboys earned a dollar a day if they were good, and the luxury of a gun belt and holster or some other fine leather work might often be determined by their own abilities as a leather worker. People were much more self-sufficient then, and you couldn’t always ride to town and get what you wanted or needed. So you made it – or paid a neighbor who was skilled to do it. Or you bartered your services for his. We try to stay as true to the old west makers as we can, and have incorporated what we found works over years of wear and use. If your old hat has a a grosgrain ribbon and bow, our hatbands are designed to just slide over top. This gives you a second unique look to your hat, just like the old time cowboys used to do, and easily slides off, allowing for use on other hats. Clever and functional and you will definitely stand out from the herd with your Last Best West Hatband! Our Old West Posters were one of the first on the web back in 2001. Our poster paper is heavy duty stock, special ordered by the ream, and is the closest we have found to actual parchment paper that would have been used in the 19th century. It’s heavy weight and won’t get torn or blown off the hitching post! We don’t stain it (reducing it’s life) all our aging is done with graphics – making them crisp and clear. Posters are all ~ 11 x 17 inches and are shipped flat. 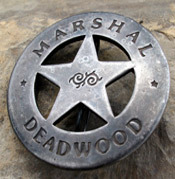 in the Old West of the last part of the 19th century a Ranger, Marshal, Sheriff, or Agent Badge was a much sought after office. With the badge went the job, and if you had the stomach to enforce the law – it was a fairly good paying job compared to many on the western frontier. We’ve got a collection of over 40 badges that are exact replicas of the very same badges made famous by the Earp Brothers, Wild Bill Hickok, Pat Garrett and many other lesser known individuals. And now you can have one too. 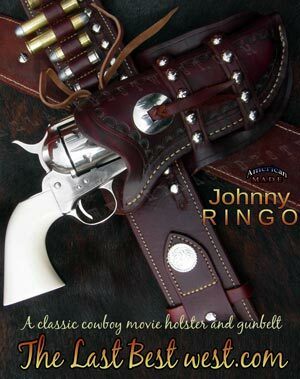 If a cowboy hat is a regular part of your attire, and you think that black jeans are dress pants, then you are going to want to read The Last Best West. Set in 1896 amidst the chaos of the Klondike Gold Rush, this western adventure tells the story of a lifelong grudge between Wasey Bruce and Poke Roberts. Their hatred travels the breadth of the North American West, and sets the men on different paths for the gold fields of the Klondike River, in the wilds of the Yukon Territories. We are always here to help, but not always at the very second you call. Please leave a detailed message and we will return it!